Drone footage (2016) of our first three homes & the Lionel Hampton trail in our backyard!! Click on link below and enjoy! Sneak Preview Phase II - Great Turnout !! 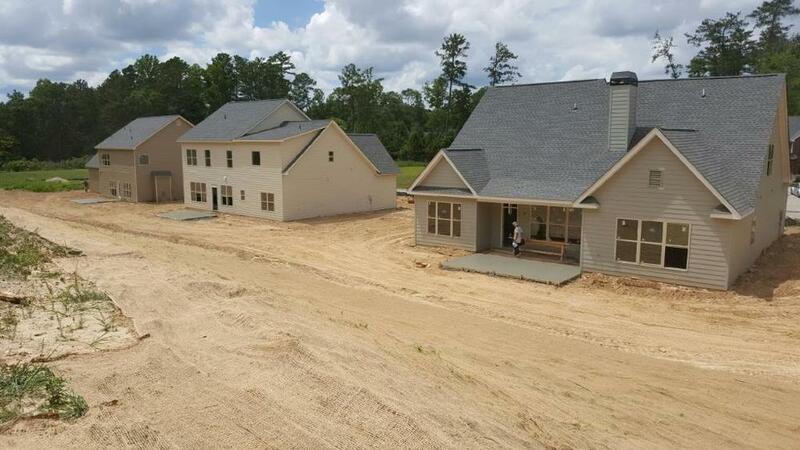 Come Visit our almost completed three model homes..
3-D Model of The Collins "Our Master on Main"
The Sales Center 3-D Walk Through link - Why we are the best!! Hampton Preserve Entrance almost done!! The neighborhood unveiling, which took place this past Sunday, was a success. Roughly forty of our friends and associates came out to show their support. The driveways and back patios are being poured this week. The patios and the Morris driveway are done and the other two driveways will be poured today. More progress is being made on the first three houses. All three lots have been cleaned up and graded so that the driveways can be installed soon. We are getting closer and closer to having finished homes. The Collins plan, the third house being built in Hampton Preserve, now has the stone accents installed. The stone nicely complements the light gray paint and the board and batten detail on this plan. All three houses are in the process of getting their final exterior paint colors. A modern palette of colors has been chosen that will blend with the natural beauty of Hampton Preserve. The painters have been busy, and now all three houses are primed. They will be getting their final exterior colors soon. Board and batten siding is going up on the triangular pediments on the Collins. This feature will give the house additional character and architectural detail. You know you are making progress on a house, when the sheetrock starts going up. The installation of sheetrock really helps you see what the rooms look like. Note the gas fireplace in each of these large family rooms. The fireplaces will have a beautiful transitional tile from floor to ceiling and will also get built-in cabinets and shelving. The Collins now has the roofing and house wrap installed. The Norwood and The Morris now have their brick and columns up. Exterior paint will be going up soon on The Norwood and The Morris, and the siding will be installed on The Collins. A lot of progress is being made, and what once were just vacant lots look like beautiful homes now.